Everything you need to know to make your Facebook page work for you. Facebook has changed. A lot. But we’ll come onto that in a bit. 35.4% of the UK population has a Facebook account, that’s 33 million users. And a hefty 23 million of those are over 30 years old. In the UK population as a whole, there are 40 million people over the age of 30. This means that you have pretty much a 60% chance of an over-30 year old to have a Facebook account, and that figure is growing all the time. 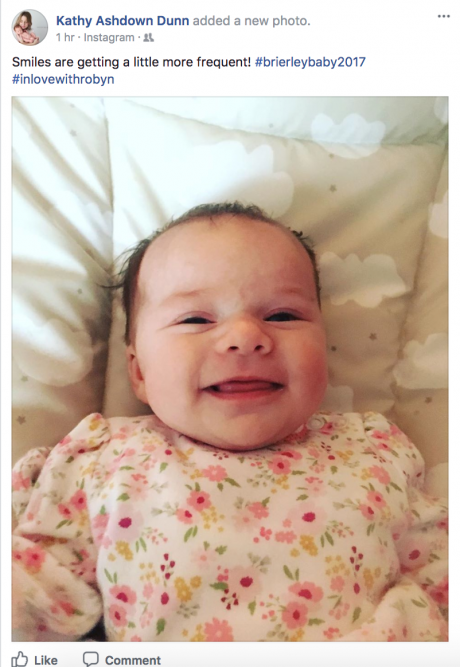 In fact, Facebook isn’t really cool for kids these days, so grandparents are joining the platform to swoon over pics of their grandchildren, and wonder why they weren’t invited on the family holiday. Now we’ve established that your target market are probably on Facebook, let’s look at what works, and what doesn’t, on this omnipresent platform. Most estate agents don’t know what they are doing on Facebook. Whilst around 80% of agents use Facebook socially and professionally, they lock down their profiles so that no one can see which football team they support, and fill their business pages with all their properties. It’s easily done. It must be, or more agents would be doing it right. So what should you be posting on Facebook? And do you need a business page? What should you post? Where should you post it? Who should do the posting? How do you know if it’s working? All good questions…. so enough preamble, let’s dive in. Facebook can be a real minefield. Facebook marketing can be a fantastic way of connecting with your audience. It allows you to portray your brand message, distinctive personality and team spirit in a fun, informative and engaging way that your website can never do. However, it can also be expensive (to outsource), confusing, potentially damaging to your reputation and hugely time-consuming. If you’re writing any kind of content – blogposts or articles – Facebook gives you a megaphone to amplify it, allowing you to reach huge numbers of people instantly. And even when you pay to distribute it, it’s still currently better value for money than any other advertising channel, bar none. Facebook marketing shouldn’t be a daily grind; it should be fun, interesting, and an integral part of your working day, (and beyond). Without respect for both Facebook as a platform and the audience you’re trying to reach, your content will get ignored and rejected, losing you credibility and market attention. For example, if I’m browsing Facebook in the evening, whilst watching tv and enjoying a glass of wine, you may be able to catch my attention with a funny, interesting or curiosity-piquing post. Anything that’s too salesy will turn me off and keep me scrolling. Keep in mind the mood of your Facebook audience, at that time, and create your content with her in mind. Your content is not about you – it’s about her. Yes, of course you would like to get her to book a market appraisal, but she’s just not going to do that whilst she’s browsing Facebook. But if you offer her an ebook or checklist called 12 Ways To Move House With Kids And Still Stay Sane, you’ll grab her attention and motivate the click by offering her something just for her. Who should run your Facebook page? You, mainly. With a little help. Just because your admin guy is under twenty, doesn’t mean he can ‘do’ your Facebook. This is a knee-jerk reaction to a lack of confidence about what you should actually be doing on Facebook, and a feeling that at least if you’re on there, that’s half the job done. Trouble is, a half-hearted, amateur Facebook presence is worse than no Facebook presence. So you can’t just approach your junior admin, and tell him to update your Facebook page every day because you don’t know what else to do. Instead, you need to create a written social media strategy, and also a style guide for posting appropriately to Facebook. Then, vitally, you need to allocate time and resources to allow anyone to do the job properly. You can’t just expect your admin to be able to update your Facebook page whilst he’s waiting for the kettle to boil. He needs to know you value the task, and that you’re prepared to invest in getting it right. The time it will take depends on your posting frequency, the remit and how much content you provide, (photos, blogposts, articles). But you do need to take ownership of your Facebook page yourself. It’s too important to delegate in its entirety, and the pages I know that have done so are mostly dreadful. So that means if you have 1000 people who have liked your page (your ‘fans’) and you post a photo of what you had for breakfast (not recommended), only 100 of them will see it (and wish they hadn’t). To reach the other 900 fans, you have to pay Facebook to show them your post. Now that’s a good thing, because I’m guessing you wouldn’t be happy to pay to show your breakfast post to those 900 people, so a low reach is going to make you work harder to get to the right people, with the right content. 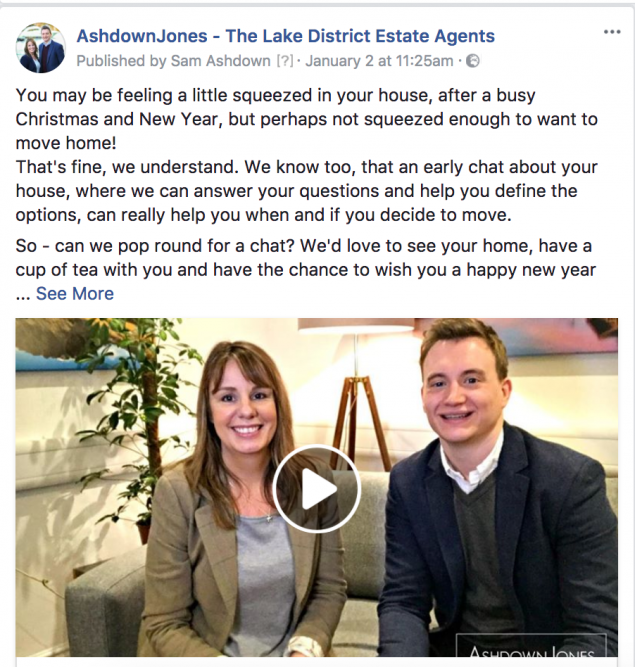 Having looked at thousands of estate agent Facebook pages, I’m going to give you a rough rule of thumb to give you a target to aim for on your page. The worst-performing pages get less than 100 new likes a year, whilst the best get 1000 a year. Our target on our AshdownJones’ page is 10,000 likes, and we’re hoping to get there in the next 3-4 years. It’ll be a tough challenge, but worth it in the end. Never, ever, ever buy likes. No matter how tempting it is, and how cheap they are, it’s way too risky. If Facebook’s very clever algorithm detects it, they could shut your page down, permanently, and even remove your personal profile. Instead, earn likes through your personality-based content on your page, and know that you deserve every one of them. What’s Engagement and why does it matter? Engagement is how many likes, comments and shares you get on your Facebook posts. It’s a more relevant metric than reach, as it demonstrates how connected your audience is with what you’re posting. Looking at most agents’ pages, very few of any posts have any likes, comments or shares at all. 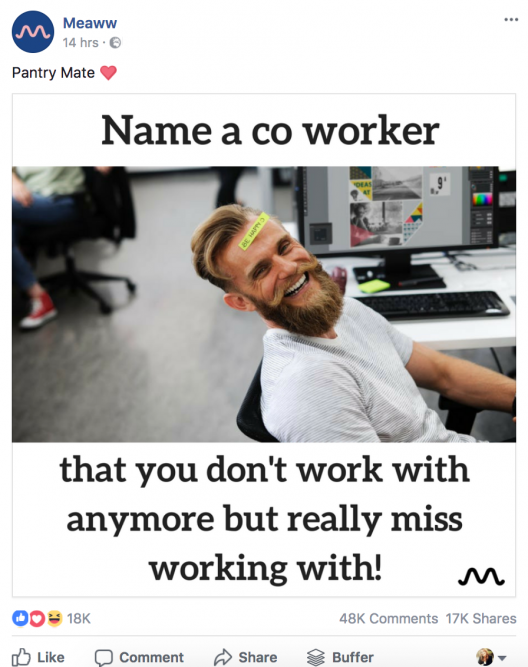 No one cares about a link to a Brexit post on some boring website, or a photo of a thank you card you get from a happy tenant. Sorry. 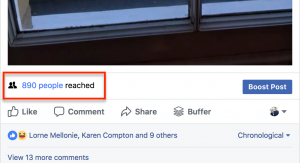 Facebook uses the engagement activity on your page to determine the reach you get: the higher the engagement, the more people will see each update you post. Your personal profile is for you as a person. Your profile allows you to accept friend requests and send them to others. Your business page is for your brand. Sometimes called a brand page (it’s the same thing), in order for people to connect with you, they LIKE your page. In that way they become ‘fans’. To have a fully-functioning business page, it needs to have been set up from a personal profile; preferably yours. Years ago, Facebook allowed users to have a business page without it being linked to a profile and it’s caused all kinds of havoc. Also, I see lots of agents’ business pages that have been set up as profiles. So they might be called [first name] Downtons [surname] Estates. You see how silly that looks? Also people have to friend you, not like your page, and that’s hard to motivate them to do it when you’re called Mr Downtons Estates and your profile pic is of a branded car. Your profile photo should be your face. Not your kids, your dog, your car, or anything else that isn’t your face. It doesn’t have to be uber professional, but nor should it be you with sunglasses on, drinking a drink with an umbrella in Marbella. You need a nice, relaxed photo of you with no one else cropped out, and an attractive background. People who are Facebook-savvy will almost certainly look up your personal profile before getting in touch, or before a market appraisal. Human beings are inherently nosy creatures and they want to see who will be knocking on their door and drinking their tea. Remember that a brand is a largely intangible thing, but you are not. You are a living, breathing representation of your brand, and that’s what people want to see. In effect, the real YOU. I keep my profile completely open, as I think it’s better for business, and to make strong, meaningful connections with people local to me. I also accept friend requests from anyone local without quizzing them for the same reason. You wouldn’t refuse to answer the phone in case you didn’t know the person calling, would you? It’s the same with Facebook. See a request as a digital phone call. 1. When you post, Facebook asks you in the bottom right hand side of the update box, who you want to post it to. You can choose to set that to certain people, friends, or public. Whichever you choose becomes the default for your next post. 2. Go into your Friends list, and you’ll see to the right of each person is a dropdown box, allowing you to put that person into a certain category of ‘friendship’. For example, if you have a list called ‘Client’s, you can add any clients who want to friend you to that list. Then the next time you post, use the dropdown box to choose ‘Custom’ posting, and exclude your Clients’ list. Easy. A word about privacy though: I made my profile fully open around three years ago, and I’ve never regretted it for one moment. I’ve made so many friends, connections and great business contacts that would have otherwise passed me by. Facebook is about expanding your world, and valuing every single connection. As I say, your profile photo also needs to be a real person, not your branded car, office or for sale board. I know that’s tricky when you have a larger company, or a team that manages your page for you. But if you were to look at an original Apple Facebook page, who would you see as the profile picture? Or on Virgin’s page? Exactly. You need to have a figurehead; a leader who people will want to follow, and to engage with on the page. No one wants to talk to a logo, but when we post on our AshdownJones’ page, people reply to me, thinking it’s me or Phil, even if it isn’t. Your fans want to connect personally with you; to feel special that they know the business owner. They’re looking for social validation and you can give that to them. Now look at your cover image: that’s the big landscape image across the top of your page. This image can be used to attract people to click, but only if it’s in their interests to do so. As an example, you could use your latest blogpost image, and link it to the post on your website. Or to your online valuation tool. Or a video of a special property you have listed. It’s a hugely valuable asset on your page, so don’t waste it by some me-me-me branding. Click on your Page Insights at the top of your page, and you may well feel overwhelmed by all the red and green numbers, graphs and squiggly lines. What do they all mean? Are you supposed to do something with the information there? 1. Page summary – ideally you want as much green as possible on here, no red. This is a dashboard that allows you to see at a glance your page actions, page views, page previews, page likes, reach, post engagements, videos and page followers. The default view is 7 days, but the dropdown allows you to change that to today, yesterday or 28 days. You don’t need to take any action, but this dashboard will keep you posting consistently and checking your progress. 2. The Whale – click on Posts halfway down the left hand side (make sure you’re still in Insights) and you’ll see a big blue shape that looks a bit like a whale. This shows you when your fans are online, so you can make sure you post just ahead of your peak times. Usually these will be first thing in the morning (7am – 8am), noon, 5pm – 6pm and then last thing, between 9pm and bedtime. Yours might be different, so check. If you see a smooth line, it could indicate lots of your fans are stay-at-home mums or dads, and if you see spikes around break times and lunch times, it could mean you have lots of office workers on your page. And the type of fan should guide your content. 3. Post types – you’ll find this tab just above the whale, above the Tuesday box. Click on this, and it will tell you the types of posts that are performing the best on your page. Ours is video, no contest, but if you’re not doing video, yours might be photos. Usually, it’s video, photos, status updates then links. If yours doesn’t follow that order, you could be missing out on posting the most popular type of content. Insights tell you lots more besides, like which posts got the best reach, and how old your fans are, but start with the basics; what you track will improve as you get to grips with the intricacies of the platform. What to actually post on Facebook? This is the question I get asked most. And my answer, the most ignored. Because you need to get personal. No more rubbish links, or aggregated content. That’s not what your fans want, trust me. They want to know what you do during your day, behind the scenes of your job, a sneak peek of a property, and lots of local news and stories. They also like tips and advice, so long as it’s bite-size and interesting. Advice videos – one of our best reach was a video I did called ‘How to make your bed when you’re selling your house’, (quickly copied by a nearby agent). Don’t overthink your Facebook posts; take a photo with your phone of anything you think your fans might like, and post it there and then. Get into the habit of doing this at least three times a day, and your Facebook page will grow massively. Competitions get us loads more likes, and even if you boost the post, you’ll usually end up getting likes for around 70p each – less than half the price you’d pay using a direct advert for likes. Invite your reactions to like your page. Hover over a reaction on a post (those little emoticons), and it will give you the option to invite them to like your page. Share your page on your own timeline, and get your team to do it too. Simple but effective. Now you understand ‘reach’, hopefully you’ll get it when I tell you that Facebook Lives get more reach than any other types of post. Don’t be afraid of your phone – it’s just a window to your audience. I’ve seen grown men crumble in front of a live video – but why? Seriously, get a grip, put on your big girl (or boy) pants and just do it. 1. Use a tripod. No ifs, ands or buts. You need a tripod. They’re cheap as chips from Amazon. Don’t forget to get a phone adapter. 2. Face a light source. A window is great; a portable battery light is even better. 3. Pick a topic, and write 5 bullet points on a board or note near the phone where you can read it. 4. Do a quick run through to practice, but don’t overthink it. It’s supposed to be a little raw, so don’t worry if you stumble a little. 5. Go live! Stay live for 10 minutes or more to give people a chance to watch live. And have fun! If you enjoy it, your audience will too. Here’s Mark Zuckerberg’s recent announcement that earned him the headline ‘Facebook Apocalypse’. “Based on this, we’re making a major change to how we build Facebook. I’m changing the goal I give our product teams from focusing on helping you find relevant content to helping you have more meaningful social interactions……. The first changes you’ll see will be in News Feed, where you can expect to see more from your friends, family and groups. If this would mean a complete change in Facebook posting strategy for you, so be it. In fact, our AshdownJones page will remain pretty much the same. Because it’s the strategy we’ve adopted from day one. So take some time to take a good, hard look at your Facebook page and ask yourself, is it going to make Zuck’s cut? Facebook is a hugely valuable resource. For us, it’s more valuable than our website. It’s also a largely untapped resource, as you’ll see when you start following your competitors’ pages. The most important thing to start doing right now, is to spend some quality time there. Get a feel for what works, and what doesn’t. What kinds of posts get comments, likes and shares? Learn from the best pages, and test out lots of different ideas yourself, so you can really start to grow your page, and in doing so, grow your community. Bottom line is, it’s time to get comfortable with Facebook because it’s not going anywhere. Would you like a chat with me, one-to-one, about your Facebook marketing? In just 20 minutes, I can tell you what I think is working for you, and what you need to change or ditch. I only have a handful of these call spots to offer, so book your place now, before your competitor beats you to it. Just tell me about your Facebook page here, and discover how to take your social media marketing to the next level, simply and profitably.